Ton'Yetta Brown, coach of the Play for Keeps basketball team, at the end of the team's final practice at Shepard Recreational Center, which is starting an in-house league. 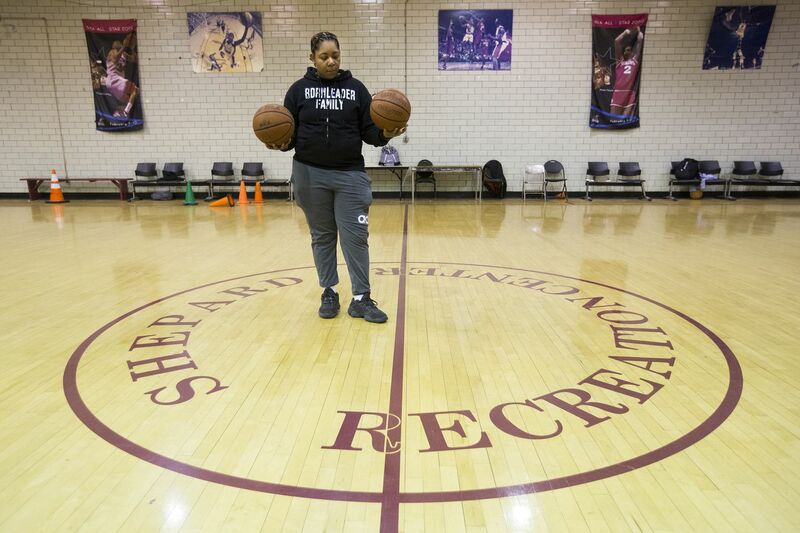 For the second time in three months, Ton’Yetta Brown gathered her players in the middle of the basketball court at Shepard Recreation Center in West Philly to deliver devastating news. In November, she had to tell them that her friend and fellow coach, their beloved Coach Bok, had been shot and killed less than a mile from the center. They huddled in a circle that cold winter day and cried as they tried to cope with the loss of someone who was more father figure than coach, more inspiration than instructor. Bakeer “Bok” Green, 34, was a popular West Philly figure, a man whose lessons about basketball and life were as grounded in his own experiences, as a teenager who spent time in a residential school for at-risk boys, as they were in his desire to keep the young men and women he coached from repeating his mistakes. Last year, he received the Agent of Change award from West Philadelphia Community Solutions “for always coming through." On Nov. 23, the Play for Keeps team accepted an achievement award on his behalf from Philadelphia’s Department of Parks and Recreation. In his honor, friends, family and team members released balloons as they shouted, “We’re going to B.O.K.” Police are still investigating his death. Green started a Biddy Basketball League called Books Then Sports about five years ago, a name that friends said captured his commitment to teaching lessons beyond basketball. Later he started an Amateur Athletic Union (AAU) traveling basketball team for kids 16 and younger called Play for Keeps. That’s when Brown, or Coach Teá as the players call her, joined him. It wasn’t until I saw the heartbreak on 11-year-old Avery Robinson’s face that I truly understood what she meant. Robinson, a small and serious young man, locked his jaw and fixed his dark eyes across the court to keep from crying as he spoke about Bok’s death. “It hurts inside,” he said. Avery Robinson (left) and Richard Maddicks play at an 8-foot basket. When the West Philadelphia’s Play For Keeps Coach Bakeer “Bok” Green was shot and killed in November, his partner Ton'Yetta Brown, “Coach Teá” took over. After Bok died, Robinson stopped playing basketball for a while, but eventually he returned to the gym. Coach Bakeer "Bok" Green, a beloved West Philadelphia basketball coach, was shot and killed on Nov. 3. Coach Teá, who works full-time as an operating room technician, asked herself the same thing when she gathered the kids after Bok’s death and vowed to continue his work. And again, when she was abruptly told that the recreation center was starting an in-house league and that Play for Keeps wouldn’t be able to practice in the gym anymore. After I first visited the recreation center in January, I planned to spend more time with the players, to share their bittersweet story about how they turned to basketball to deal with the grief of losing a coach who taught them anything could be worked out on a court. But we ran out of time, something young people in this city are entirely too familiar with. When I asked recreation center staff about the decision, things got confusing. One person told me that the group’s permit had expired, and it had been extended only out of love and respect for Coach Bok, who had volunteered at the center for years before working there. Someone else told me that the kids were free to try out for the in-house teams and Coach Teá could coach if she wanted, an offer she insisted was never made. Finally, Philadelphia Parks and Recreation spokesperson Alain Joinville said they would try to find a nearby recreation facility for the team to practice in, hopefully by next week. I was glad to hear it, because what was lost in the confusion was the team’s commitment to continuing Coach Bok’s legacy. “It just feels like another loss in a very short amount of time,” said Melvin Clarke, who routinely watched his 9-year-old namesake play several times a week from the sidelines, usually while holding his youngest, a baby who squealed in delight as he watched the players run across the court. On that last day in their gym together, young Melvin and Avery were among the last players to leave, lingering long after others had left. One more dribble down the court, one more swish through the net. A few more moments together inside a gym that a beloved coach had turned into their sanctuary. Coach Teá cried as the stragglers hugged her. Maybe this was goodbye. Maybe it was just see you later. “What’s next?” asked assistant coach Kevin Baylis. Coach Teá pauses to salute Coach Bakeer "Bok" Green at the end of their final practice at Shepard Recreation Center on Feb. 15.